We had our last post partum appointment with our midwife on Tuesday evening. Darwin barely fit in the scale sling, and surprised us by gaining about 2/3rds lbs per week over the last three weeks! 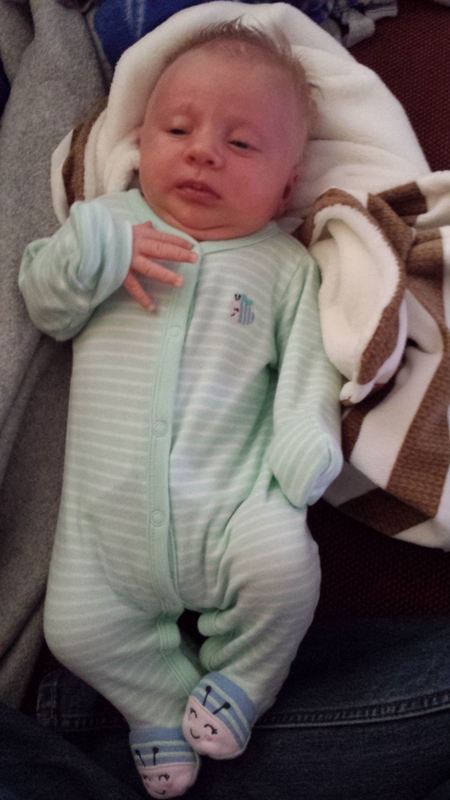 She’s now above the 75th percentile in weight. Everything else looks good too. Dar is on track for all of the developmental markers they check at this point and I’m almost completely healed up from the birth. All-in-all, life is good – Darwin has been a delight. Although as my mother says, even an easy baby is a whole lot of hard work. I’m nursing her on demand, which generally means a minimum of two hours between feeding except when she wants to comfort nurse when she has gas, which means pretty constant nursing for up to a couple hours. That doesn’t happen a lot, but it’s hardest at night. I’ve fallen asleep nursing the Bug more than once! Sleeping in 1 to 2 hour chunks is also a bit rough, although better than it was during my 3rd trimester. MamaLee has been awesome and taken a few evening ‘shifts’ with milk that I’ve pumped so that I can sleep for 3 or more hours in a stretch. When I wake up from those naps is strange how much I just want to hold Darwin. I appreciate that she likes to be held as much as I love holding her. The last appointment would have been very sad if Leah weren’t our midwife’s master’s student, (hopefully) soon to be PhD student. She is part of our family, so moving beyond our regular appointments is doable without too much sadness. Also knowing that she’s still here for us if something comes up helps. She’s less interested in sleep than I am in writing my thesis. This could be a problem. SMILES ALL DAY! Seriously. 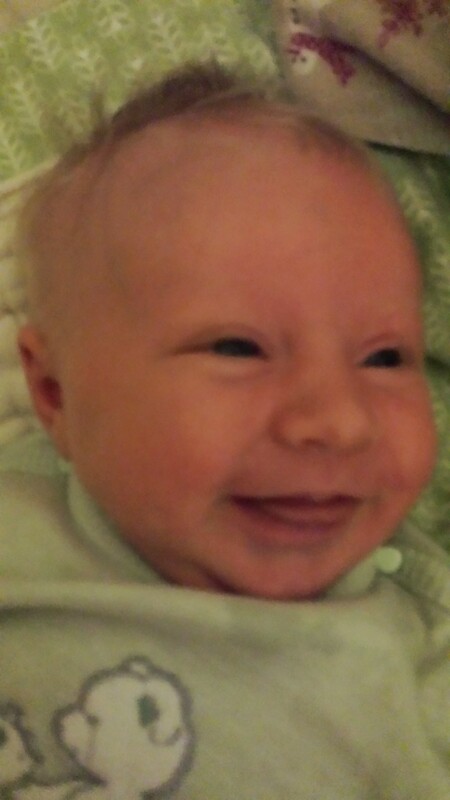 How does anyone get anything done when their baby starts smiling? Darwin has passed the 5 week mark and I’m blown away by how much she has changed already. At her 4 week appointment she already weighed in at 2 ounces over 9 lbs, and she has outgrown several of her newborn outfits (including her first outfit, which was roomy only a couple of weeks ago!). I’m only slightly sad that she’s moving out of the newborn phase. Mostly I’m excited to see her developing new abilities daily, and I can hardly wait for the time when she can smile intentionally! Last Thursday was her first really difficult night, in which Darwin thought it best to fuss and nurse every thirty minutes all night long. I blame it on the convergence of gas – inducing brie and a growth spurt. Going off dairy entirely cleared up most of the gas within a couple of days. I miss ice cream, but it’s worth not seeing Dar kick her legs and scrunch her face up with gut pains. In terms of myself, I’m starting to actually feel like I’m mostly recovered from laboring and pushing this little Bug out. When I was about 8 months pregnant I was eating dinner with my parents on their porch and a woman walked by with a six month old baby in an Ergo. I remember thinking how jealous I was that she had already gone through the unknown process of labor and the recovery that was required afterwards. FridayI walked our rather exuberant dog a mile with Dar in her Ergo. It was a beautiful fall day and I realized just how much time has passed since September 10th. Now that I’m on the other side of giving birth I can only hope that the mama I saw walking with her little one had as easy a recovery as I have had. Darwin just let me sleep for 4 connective hours. I think it’s been about 3 weeks since she did that. 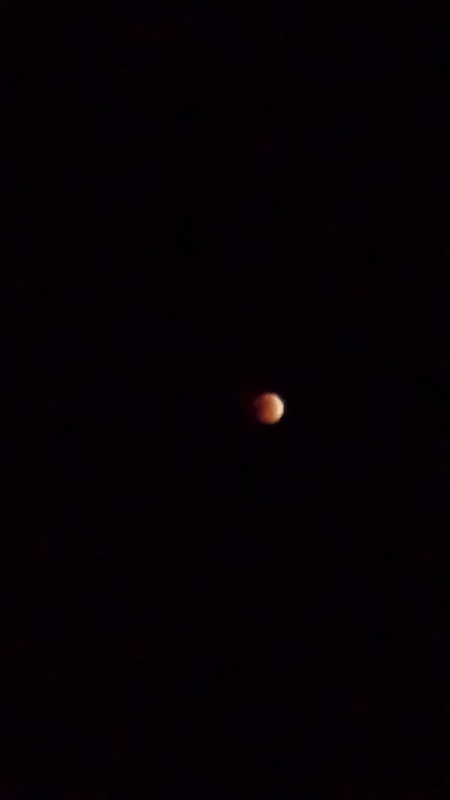 Also, there’s this really cool lunar eclipse happening. Good timing little one. The natural world is amazing. Everything about my pregnancy, labor, and the birth of my daughter went exactly as it needed to. Had she not been right side, it’s likely she would have delivered early (possibly significantly early). Had I not labored at home for 18 hours and made it to 7 cm before transferring to the hospital, it’s likely the hospital staff would have said “you’re not progressing and you’re exhausted, we should do ac-section”. As it was, showing up at 8 cm (I dilated another centimeter on the car ride), the assumption was that I would deliver vaginally. That very painful, exhausting 18 hours was worth it to me. Had I chosen not to transfer when I did, is very likely I would have ended up with an emergency transfer, either as a result of dehydration or when Darwin started throwing late decels when I was pushing. Such a transfer would have been traumatic for me. She was placed in my chest immediately. MamaLee got to catch her. She was nursing in minutes. All in all, I feel incredibly lucky that things progressed the way they did, on all counts. 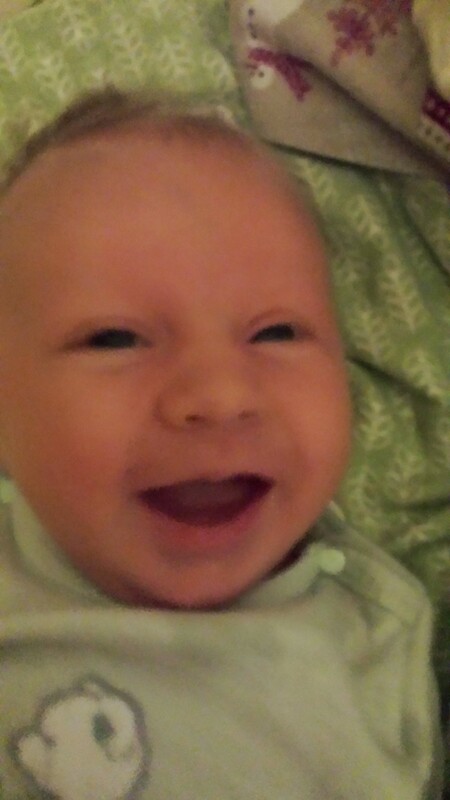 I have a happy (as in, I didn’t know babies came this happy), healthy baby, born vaginally. All listed on my ‘most important’ list for my birth plan. 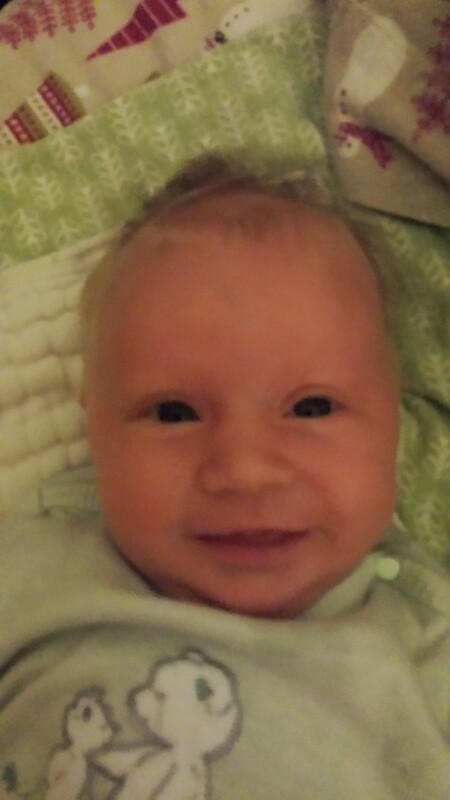 I was not able to snuggle into bed with my wife and new baby, something I greatly looked forward to, especially during my labor. I was not there when she was weighed and measured. To be fair, I didn’t know I wanted to be, or that it was something I would be sad to miss later. If I had known I would have insisted on waiting to go to the bathroom. It is also possible I was in the room and missed it. I was pretty fuzzy. Having a meal with my birth team after we settled in together. Food releases oxytocin – a hormone that helps build bonds. My birth team was stellar. I wanted to be able to share that with them. Not being on my back while I pushed. This couldn’t be helped, as I’d had an epidural. The epidural was worth it. I’m just sad that I had to be in the worst position possible. Sitting in the hospital for 30 hours waiting to be allowed to go home. I appreciated to ice packs that were available at the push of a button. I also appreciated the morning and evening light that provided some great first pictures of our little Bug. But it was still a hospital and I didn’t want to be there. 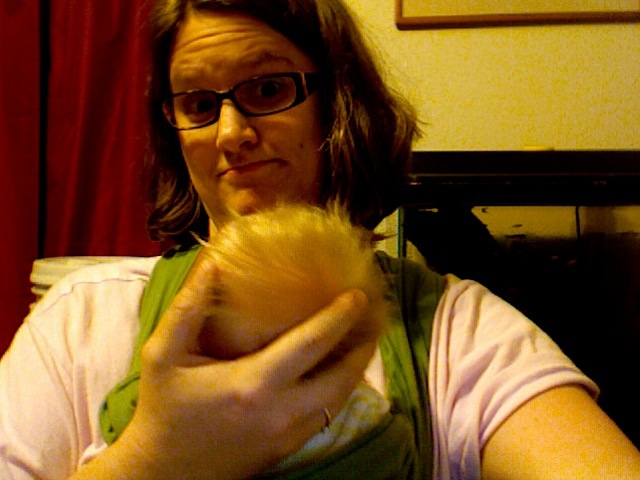 Having to state that I wanted to nurse Darwin while the nurse pricked her heal for the metabolic screen. The nurse was ready to whisk my baby away and stick a needle in her foot! It should be suggested that mamas at the very least be there with their newborns. I’m sure I’ll write more about this as things come to mind. I encourage others who feel the need to debrief after birth to do so, especially if things didn’t go according to plan. But even if they did, I suspect it would be helpful for many new mom’s to talk about what was hard for them. There is nothing quite as sweet in this world as early morning skin-to-skin nursing and milk drunk snuggles. Being a mama is amazing.